Submitted by gored82 on Sat, 01/09/2010 – 2:53pm. How can you forget Terry Leach? Submitted by Jon Springer on Sat, 01/09/2010 – 9:45pm. I knew I was overlooking some. I dig Terry Leach. Read his book! Steve Schmoll is a stud!! Submitted by Anonymous (not verified) on Sun, 01/10/2010 – 12:54pm. Steve Schmoll is a stud!! Why did the Mets let him go?? They will live to regret that decision! Submitted by gored82 on Sun, 01/10/2010 – 3:02pm. Schmoll is almost 30 and hasn’t pitched in the majors since 2005…who are you kidding? Submitted by Anonymous (not verified) on Sun, 01/10/2010 – 6:11pm. There is a great book written by Richard Grossinger in 2006 titled “The New York Mets” which has a whole chapter talking about Terry Leach. Submitted by Chris C (not verified) on Mon, 01/11/2010 – 9:00am. 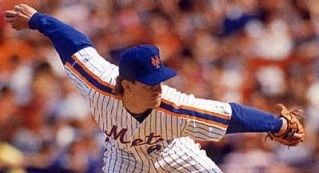 Terry Leach never seemed to get a fair shake as a Met… He was constantly getting outs, could start, go long and handle short relief. He went 7-0 when the Mets needed him most (as a starter in 1987), yet his job always seemed to be in jeopardy with Davey Johnson at the helm. He probably should have made the All-Star team, but Johnson did nor include Leach. I was a teen at the time, but I always remembered this guy getting outs while on the mound. He probably deserved better. Submitted by Anonymous (not verified) on Mon, 01/11/2010 – 10:31am. FACT: By not giving Steve Schmoll a fair chance to pitch in the bigs, the Mets have brought down upon themselves a myriad of curses, beginning with the 2006 playoffs, and continuing through the 2007 and 2008 collapses and the 2009 disaster. This curse will not be lifted until the Mets repay both Double-S and society for their sins. Retiring the number he was never issued would be a start. Steve Schmoll also happens to be a winner in the game of life, which is more than one could say for his detractors. Submitted by Ranjrz5 on Mon, 01/11/2010 – 10:38am. Johnson said that Leach didn’t have enough starts or innings to warrant consideration for the All-Star team… way to support a player who’s doing everything he can for you. Submitted by Chris C (not verified) on Mon, 01/11/2010 – 11:32am. Yes… he went 7-0 in a pinch for an injury-riddled Mets team and keeps them into contention on the way to an 11-1 record. If I had the time to look it up, I am sure there would have been precedents to sending those with similar stats to Leach to the All-Star game in the past. According to Baseball-Reference.com, Leach had a 24-9 record as a Met. Submitted by Anonymous (not verified) on Mon, 01/11/2010 – 11:34am. His clubhouse antics (I won’t go into details) creep everyone out. I guarantee you nobody in the majors would put up with that kind of disturbing behavior. Submitted by Jon Springer on Mon, 01/11/2010 – 2:29pm. I demand all the unsubstantiated dirt on Steve Schmoll immediately. Submitted by Anonymous (not verified) on Mon, 01/11/2010 – 2:43pm. I seem to recall that the baseball gossip site called “On the DL” http://itsasecretsohush.blogspot.com/ featured a blind item that some believed referred to Schmoll. I think there was something about groupies, peanut butter and science experiments. He’s a complete and utter nutcase. Submitted by gored82 on Mon, 01/11/2010 – 3:45pm. Submitted by Anonymous (not verified) on Mon, 01/11/2010 – 5:07pm. Think of all the bum relievers that the Mets have thrown to the wolves over the last few years: Claudio Vargas? Brandon Knight? Jon Adkins? Willie Collazo? Why not Steve Schmoll? Pray tell, why not Steve Schmoll? There must be more to the story. Keep in mind, that this is the same organization that didn’t give half a chance to Heath Bell, Brian Bannister, or Matt Lindstrom. Submitted by gored82 on Mon, 01/11/2010 – 8:37pm.